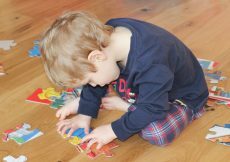 Play-Doh is a staple toy and long-term favourite in this house. For the kids, I mean. I won’t lie, as a mum I’m not massively keen. It does keep them amused for hours though, and when you’ve got deadlines or you’re just super tired and unable to human, Play-Doh is a godsend. And if they argue, you just rip it in half so they can have some each. 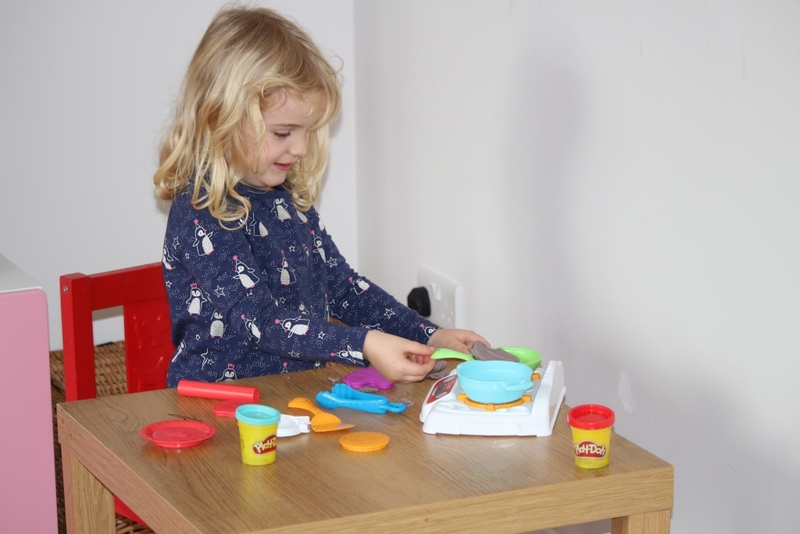 Whenever the Play-Doh comes out, it is always used to make biscuits and cakes which I then have to pretend (convincingly) to eat. Delicious. If questioned about what she did that day at school, my oldest always says she made cakes out of Play-Doh (even if there wasn’t any). 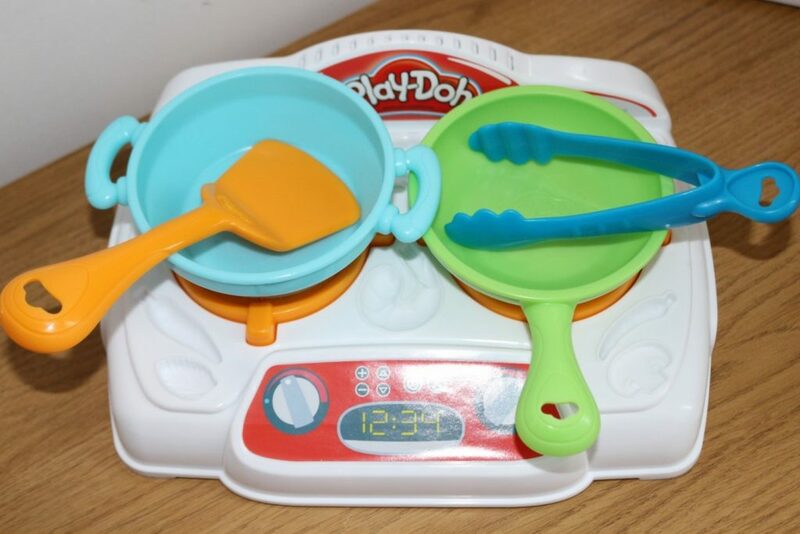 The Play-Doh Kitchen Creations Sizzlin’ Stovetop from Hasbro is a fun toy for any wannabe Play-Doh chef. Inside the box, you get five pots of Play-Doh in a selection of colours, four plastic moulds (a fish, steak, an egg and one I’ve not quite figured out. Biscuit maybe? ), a knife and fork and two plates, a rolling pin, two pans, one set of tongs and a spatula, as well as the Sizzlin’ Stovetop itself. On top of the stovetop are moulds to make Play-Doh food including carrots, broccoli and prawns. It has two ‘burners’ which sizzle as the pans are placed on top, giving a realistic cooking sound. Be aware that it requires 3 AA batteries to make the sizzling sound and these are not included, so you will need to stock up. 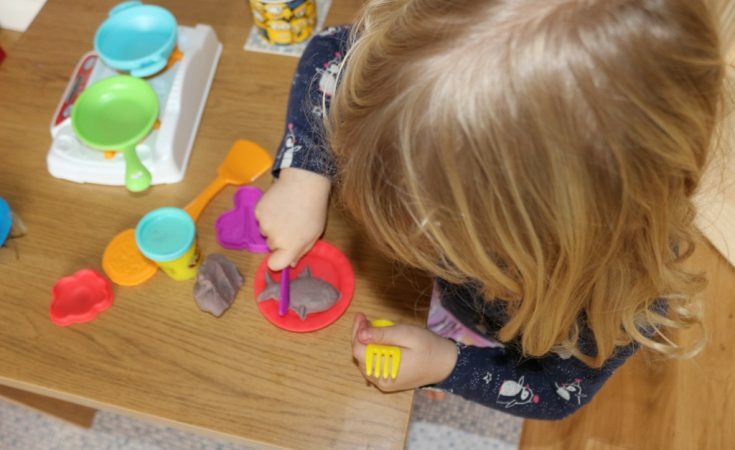 How easy is the Play-Doh Sizzling Stovetop to use? 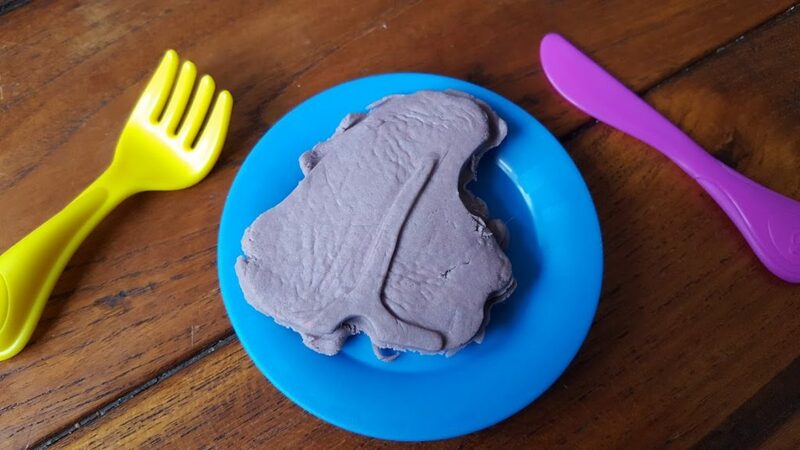 No, this is not the Play-Doh that came with the kit, but some that was lovingly mixed together to create an unappetising grey/purple colour. I’m too mean to crack open the new Play-Doh just yet, given it will last 0.25 seconds approx before it becomes this shade too. The little moulds on the stovetop are somewhat trickier to get right and they probably won’t come out like the ones on the packaging unless you are able to provide parental assistance (and even then…). I think the Play Doh Sizzlin’ Stovetop has a lot of fun play potential. 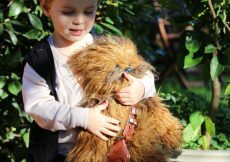 My daughter aged four enjoyed creating with it, as did my son who is aged two. 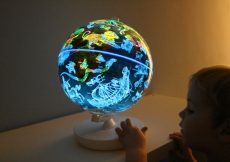 It is a great toy to encourage pretend play and develop their imagination. 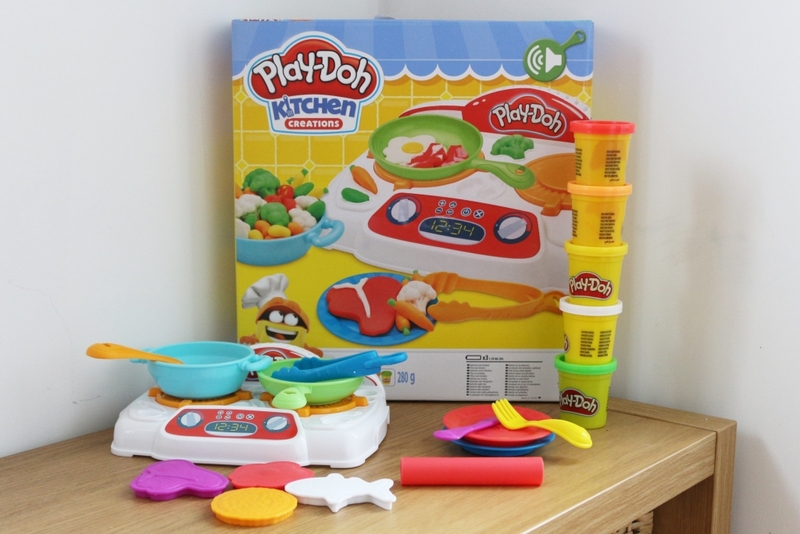 You can buy the Play-Doh Kitchen Creations Sizzlin’ Stovetop, RRP £25, from most toy retailers including Amazon here. You can follow Hasbro Toys on Twitter for updates. It was almost half price at the time of writing this, which is fab, and it will make a brilliant Christmas gift (even better for somebody else’s kids…). The Play-Doh Kitchen Creations Sizzlin’ Stovetop was given to us free of charge for the purposes of this review but words and pictures are mine.